Obituary for Missy Willey | Thomas Funeral Home P.A. Missy Willey, loving companion of Joyce Willey and the late Buzzy Willey. 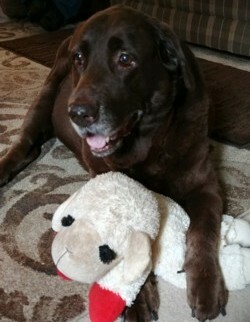 She was born November 20, 2008 and went to “Rainbow Heaven” on April 12, 2019. Missy attended the Maryland Shore Pet Resort in Vienna from April, 2010 until October, 2016 when they closed. She was loved by many people especially Buddy and Pam Bloom, Mitch Anderson and Mabel Harding, who took care of her during the day after the Pet Resort closed. She loved her neighbors as she also brought joy to them. Missy will be missed by many: Karen, Mr. Ed, Ms. Freida, Mr. Frank, Ms. Connie and Darren and Jenny. She always had hugs and kisses for everyone. Nothing went on in the neighborhood she didn’t know about and would let everyone know something wasn’t right or she wanted to say “Hello”. Missy loved parties, Christmas, chasing cats, TV shows, SpongeBob and Wheel of Fortune. Family and friends would like to thank Dr. Gosser, Dr. Spofford and the staff at Bayside Animal Hospital for all they have done in the last few months of her illness.